How to choose an enameled Dutch oven: Is Le Creuset worth it? Le Creuset vs Staub: is Staub worth it? Why does Le Creuset cost so much? What are my alternatives? Top: All-Clad Stainless. Bottom: Lodge Logic Cast Iron 12-inch (SK10) skillet. 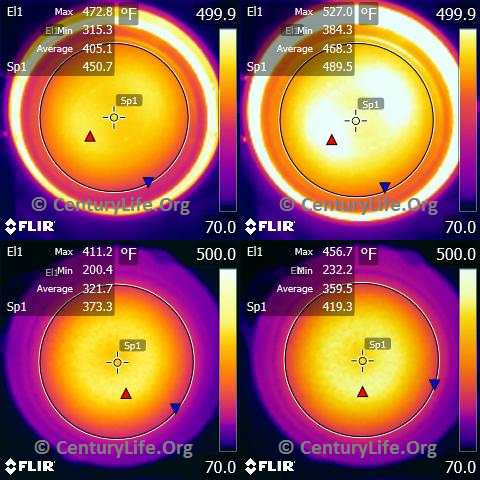 The left images are after 4 minutes of medium heat on an 1800-watt induction cooktop; the right images after 5 minutes. (Ignore the reflections, which make the sidewalls of the All-Clad look hotter than they really are.) The All-Clad’s aluminum layer is only about half the thickness of the ~5 mm thick cast iron, yet the All-Clad is beating the cast iron in even heating AND speed. For instance the center vs. edge temperature difference after 4 minutes is 157.5F for the All-Clad and 211.2F for the Lodge. Le Creuset (pronounced by French as “leh CREW-zay” and Americans as “leh crew-SAY”; just don’t call it “leh kressit”) is a French company dating back to 1925, when Armand Desaegher, a caster, and Octave Aubecq, an enameler, joined forces and coated cast iron with porcelain enamel. It was a success and the rest is history. Le Creuset’s claim to fame is their enameled cast iron cookware, especially their Dutch ovens–or French ovens, as they like to call them. So for purposes of this article, I am talking about just enameled cast iron cookware–mostly Dutch ovens, but some topics are applicable to enameled cast iron skillets as well. “Le Creuset” means “the cauldron” in French, and Le Creuset insists on calling its most famous products “French” ovens. Yet many people call them Dutch ovens, because the Dutch were famous for making high-quality, thick-walled, cast-metal pots in the 1600s, so the term “Dutch oven” stuck regardless of who actually made the pot. It will probably continue to stick despite Le Creuset’s best efforts. But a “Dutch oven” by any other name would cook just as sweetly. Q: What’s a Dutch oven (also known as a French oven or cocotte, pronounced “ko-KOT”)? A: A Dutch oven is any thick-walled cooking vessel with a lid. There is no requirement that a Dutch oven be made of cast iron. Dutch ovens can be made from aluminum, copper, and multi-layered materials (e.g., stainless steel bonded with aluminum and/or copper). Ideally, the sidewalls of the Dutch oven should be heat-conductive and the lid should be tight-fitting and heavy enough that you don’t get too much evaporation during cooking. Q: Why does Le Creuset cost so much? A: The short answer is that it’s a) made in France using higher-cost labor than you can find in China; b) Le Creuset likely has higher marketing costs that many rivals; c) Le Creuset likely has higher quality control and sourcing standards and enamel quality than many rivals; d) Le Creuset honors its warranties, unlike some companies that pretend that product defects are the result of user abuse; and most importantly e) product prices are determined by what people are willing to pay, not how much it costs to produce a product. Cast iron is a relatively inexpensive material, and despite reasons a) through d) above, I suspect Le Creuset makes very healthy profit on its French ovens anyway. That said, here’s a word of caution: only buy from companies that manufacture their own products and from well-established cookware product lines if you can help it. Many companies–even big-name companies–merely import product from Chinese factories for resale, and often don’t spend enough resources to verify quality after the first batch. It takes money and expertise to continuously ensure that products lie flat, do not contain harmful or radioactive chemical contaminants, are polished properly, and so on. If a company doesn’t operate its own factories in China, it could end up like Lumber Liquidators, which sold floorboards with excessive formaldehyde that leaked into the air of the homes it was installed in, which increased consumer cancer risks among other things. Lumber Liquidators told its Chinese partner that it wanted in-spec product, but received out-of-spec product anyway, and nobody caught the discrepancy until end-users started getting unexplained symptoms like headaches and nausea. 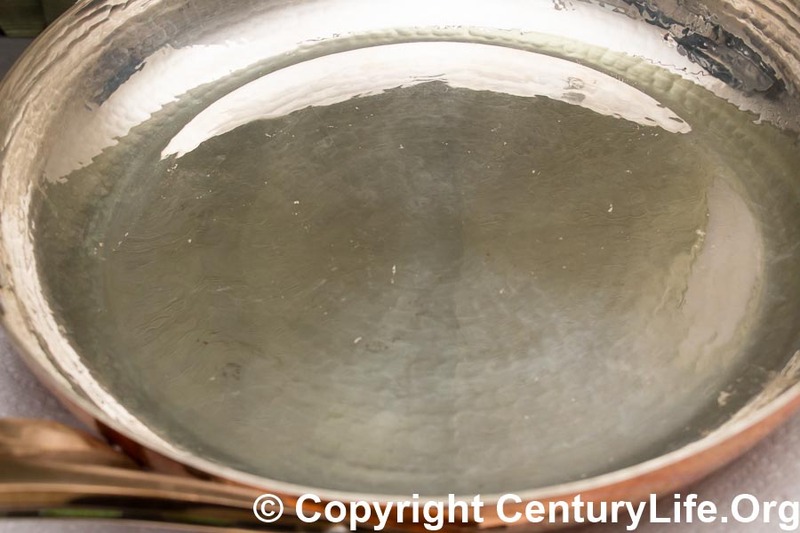 There are many more examples of Chinese and Indian exports containing toxic or radioactive chemicals, and even more examples of Chinese cookware falling apart, such as handles breaking off while in use, frying pans exploding or popping rivets off, enamel coatings cracking and flying off, ceramic roasters shattering, lids breaking, etc. In contrast, chemical contamination and structural failure are almost unheard of with cookware made in the USA/EU, such as All-Clad and Le Creuset. Q: Is Le Creuset worth it? That is, is worth the price? What is the difference between 3-ply (tri-ply) and 5-ply and 7-ply? How many plies do I need?? You occasionally see breathless marketing material about how their fancy cookware has heat-conductive walls that have more than three plies. Q: How thick does a layer have to be, in order to be counted as a “ply”?